Nine MHS students competed in the statewide science bowl competition at Iowa State on Saturday, January 26. 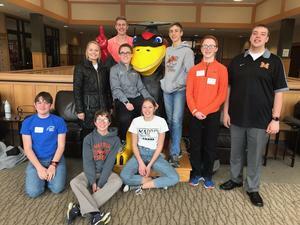 Nine MHS students competed in the statewide science bowl competition at Iowa State on Saturday, January 26. Students formed two teams that competed in a round-robin style tournament against other schools from around the state in a challenge involving questions related to various science and math fields. Students prepared at school by practicing in their free time with junior high math teacher Mr. Tim Titus. Thank you, Mr. Titus for providing this learning opportunity for our students!